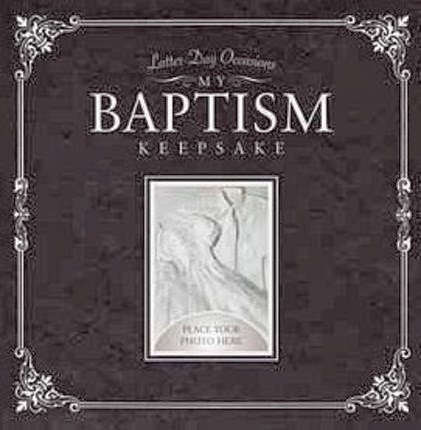 Last week I told you a bit about LDS Baptism. 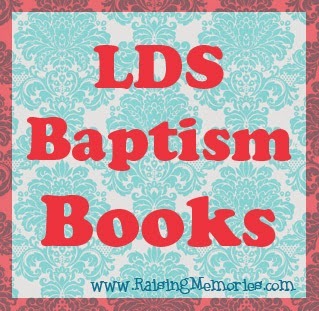 Today I want to share with you (especially those of you who are LDS and have children who are approaching their 7th birthday) some awesome LDS Baptism Books that can be great resources for you as you try to prepare your child for baptism. Deseret Book sent me some of these books to check out and I want to share our experience with them, with you! 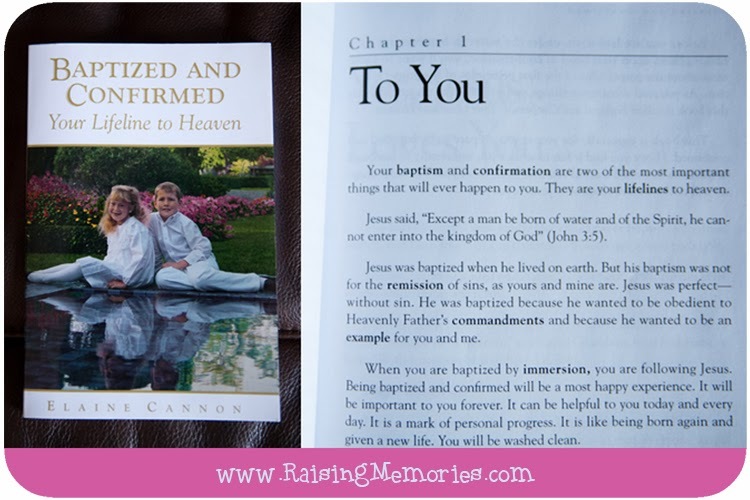 So, the first book is called Baptized and Confirmed: Your Lifeline to Heaven by Elaine Cannon. I read this book (a chapter at a time) to Talia for a couple of months leading up to her baptism (we didn't read it every night and I wanted time to talk about what we read and make sure she understood everything). It was first printed in 1986 (before I was baptized ;) and you can totally tell by the photo on the front. :) But of course the things that Elaine Cannon (the author) wrote about all apply to today. It is written to the child, as if she is speaking to them. There are questions and stories to illustrate the topics discussed in each chapter. There is a glossary at the back of the book to explain some of the vocabulary in the book (I found this handy because the words in the glossary are bolded throughout the book, so it reminded me to stop & make sure Talia understood them as I read. Another thing that I liked about this book was that it listed scriptures to look up. We didn't always look them up, but I plan to go back through the book with Talia to look up and mark some of these scriptures in her new scriptures (that she got for her baptism from her grandparents). I thought this book was great for a review of what she had already learned (and a great way for me to be able to make sure that she understood the things she had been taught). 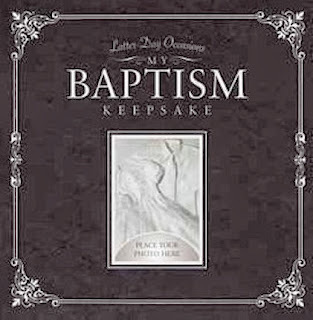 The next book is called My Baptism Keepsake by Sara Staker. You all know how much I love photography and I loved this book largely because of the photos! It is an ABC book. 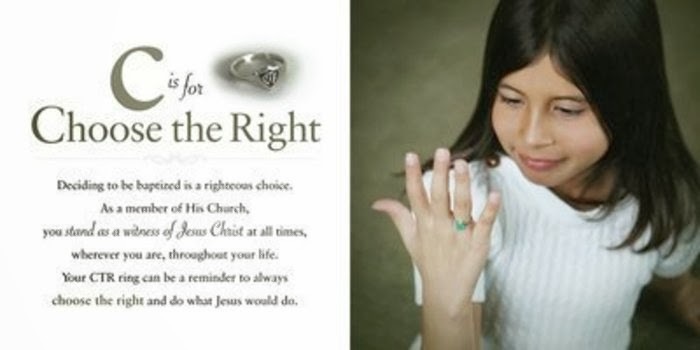 Each spread has one page with a photo on it and one page with a letter of the alphabet, something gospel-related that it stands for (that relates to baptism) and an explanation. 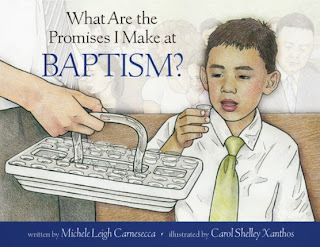 This is the book we used for recording information about Tala's baptism. 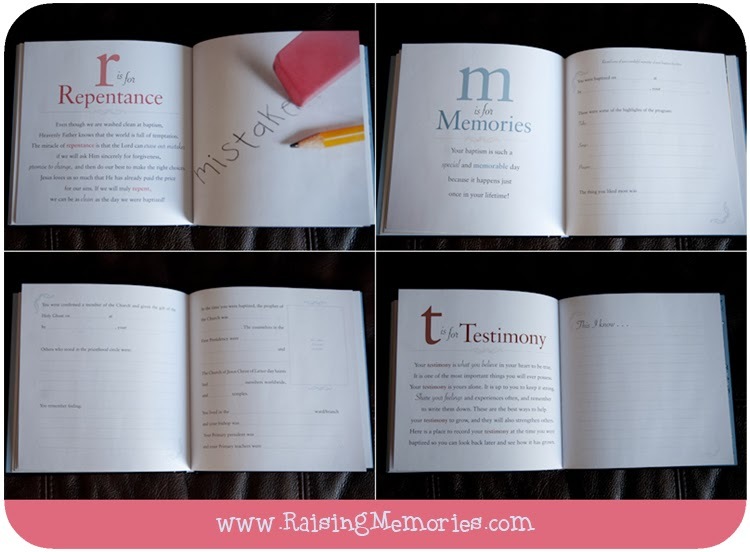 The whole book is about writing down information about the child, their parents, grandparents, and their baptism. We brought it with us to her baptism and put it out on a table for guests to sign and write little notes to her. I really like this book a lot! It's cute and kid-oriented with Val's animation throughout, and it has places to glue in photographs (I'm looking forward to adding more photos to ours!) I love that it's hardcover and I can't really complain about it at all. The next book is called What Are the Promises I Make at Baptism? 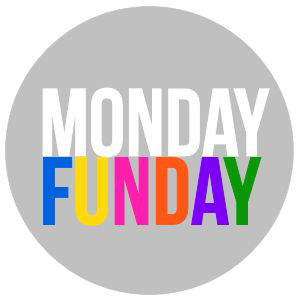 by Michele Leigh Carnesecca and Carol Shelley Xanthos. 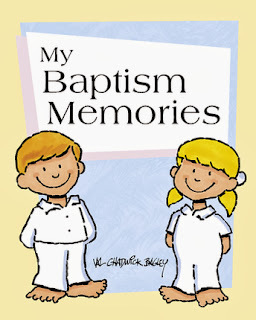 This one is a storybook that teaches about the covenants made at baptism. It explains everything in simple terms with easy-to-understand examples of how children can apply the information in their lives. It's 30 pages long. I really like this one a lot and I've ordered the sequel to this book, called How Does the Holy Ghost Make Me Feel? 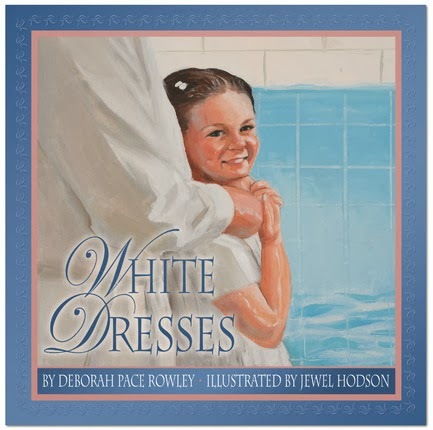 The last book is called White Dresses by Deborah Pace Rowley. 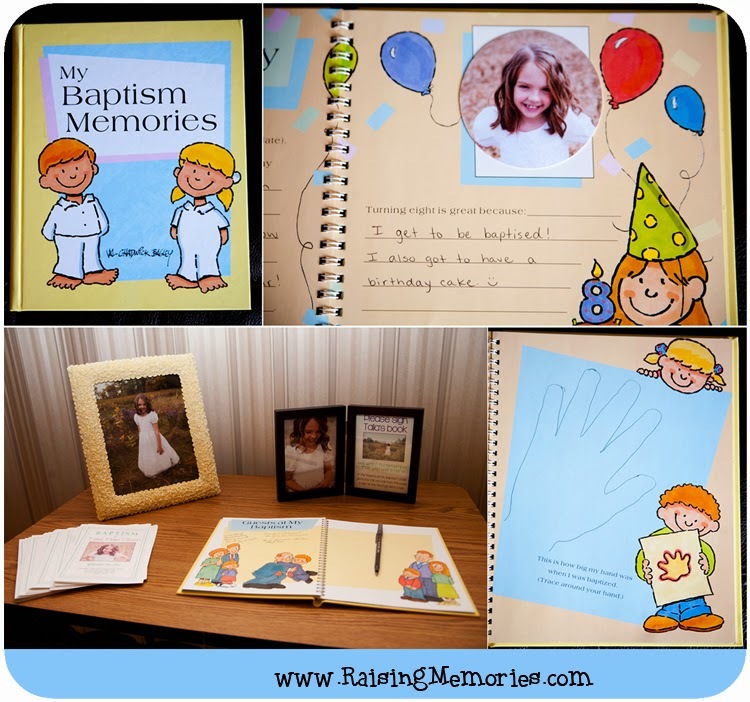 All of these books are such excellent tools for helping your child to prepare for baptism and for recording the special details and memories from that special event in your child's life. I hope I've been able to give you some more details about the books than you would find online elsewhere, to help you if you're shopping for something like this! 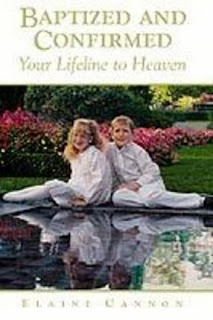 If you're interested in purchasing any of the books, you can just click on the title of the book (which is a link) and it will take you to Deseret Book's website, to the page where you can purchase that book. Thanks for the ideas. My daughter is getting baptized next month so we'll have to get some of these!